The research arm of the live market analysis firm Briefing.com has issued a report on the effects the Marketplace Fairness Act would have on the economy, including both corporate and government perspectives. Some lobbyists for the online retailers are contending that these new requirements are actually a new consumption tax. That is not necessarily true. All 45 states that have sales taxes require consumers to collect the tax on online transactions themselves and submit them when filing taxes each year. States, however, lack proper enforcement gauges and audit abilities. Thus, most consumers understate the sales taxes they actually owe. The benefits to state and local governments and brick-and-mortar retailers should outweigh the decline in consumers’ disposable income. State and local governments currently have nearly $3.0 tln in outstanding debt. While the recovery of lost tax revenue will not be enough to pay off the debt, it will help prevent more cuts to projects and services until the economy fully recovers. On the business side, retailers like Best Buy (BBY) will see their prices become more competitive with online retailers. That should boost overall retail sales, increase profits, alleviate pressure to cut payrolls further, and improve hiring conditions. At the same time, online retailers, like Amazon, generally do not have large workforces or sales staffs. The loss of online sales will lower online retailer profits, but should have few negative effects on overall employment levels. That means the collection of sales taxes by online companies should result in a net gain in aggregate wages as stronger employment levels at brick-and-mortar establishments more than offset the potential losses from online retailers. From an economic perspective, there is little negative impact—and perhaps some positive impact—from an increase in tax revenue and a more level playing field in the retail sector. From a corporate perspective, the battle is only in the initial stages. As the political story plays out, other online retailers are likely to go the route of Amazon (and eBay) by negotiating regional/state agreements to mitigate the impact of potential tax increases. At the end of the day, online retailers have gotten away with not paying/collecting taxes. Eventually, that will come to an end. Los Angeles Times: Online sales taxes [are] not taxation without representation. We had planned to respond to and correct the inaccuracies in Senator Jim DeMint’s recent Wall Street Journal op-ed on the Marketplace Fairness Act, but the Los Angeles Times, the Retail Industry Leaders Association (RILA), and the National Retail Federation (NRF) all beat us to the punch. The first to respond was the Los Angeles Times, which emphasized that collecting sales tax online is not taxation without representation—in fact, as we discuss below in more detail, the origin-based sales tax Senator DeMint supports would actually create taxation without representation, not prevent it. The system proposed by the bill keeps power in the hands of the states and their residents. Then, RILA released a press release that itemizes nearly every statement in the op-ed and offers either a correction (there were a lot of misleading or false statements in the piece) or a differing viewpoint for each. For its part, the NRF sent a letter to senators Enzi, Durbin, and Alexander—the three main sponsors of the bill—rebutting Senator DeMint’s assertions. 1. Sales tax is already due on online purchases. 2. The Marketplace Fairness Act would not require online retailers to “pay sales tax” (in their own state or any other). It would end a loophole that lets online retailers avoid collecting sales tax from their customers. That sales tax is due to the state where the customer lives (and presumably votes), and it pays for roads, fire and police departments, schools, and other public services. It is not taxation without representation, any more than the sales tax you pay at your local drugstore is. 3. By allowing states to require online sellers to collect sales tax, the bill would level the playing field for all retailers. The federal government shouldn’t pick retail winners and losers, as it does when it says online retailers don’t have to collect sales tax. 4. The bill doesn’t create a national sales tax or tax online access or online shopping. It actually gives power back to the states, who would get to decide for themselves whether and how sales tax is applied. 5. The bill doesn’t raise taxes. It just gives states the power to enforce their own sales tax laws. States retain the authority to determine sales tax rates, which apply only to goods sold within the state. 6. Senator DeMint supports an origin-based sales tax. “Origin-based sales tax” means that the sales tax rate where the seller is located is applied to the purchase, and it currently only applies within a state’s borders. Essentially, a state can say that if both seller and buyer are located within the state but in two different tax jurisdictions, the seller’s sales tax rate applies—and the sales tax the buyer pays is sent to the seller’s location. Imagine if this were applied nationally. The very thing Senator DeMint fears would come true: taxation without representation. Because under that system, if I live in California and buy something from a seller who’s in New York, I have to pay sales tax to the State of New York, where I do not live or vote and where my tax money would go to pay for things I do not benefit from or use—and I’d have no say in how New York used my money. It’s the very definition of taxation without representation. Senator DeMint is right that taxation without representation is a terrible idea, that the “nexus among Americans, their taxes, and their votes must remain as tight as possible. It is the essence of our democracy.” Unfortunately he’s completely wrong about how to make sure you get to vote on how your sales tax dollars are spent. Sales tax must be (and, in most states, is) destination-based—it must be applied to the state and region where the person paying the tax lives, to ensure the person paying the tax has a say in how that tax money is spent and benefits from the public goods that tax money provides. The Los Angeles Times article, the RILA press release, and the NRF letter make other good points, too. Take a look. What wasn’t said at yesterday’s Senate hearing, but should have been: Free! At yesterday’s Senate Commerce Committee hearing, numerous senators voiced their support for the Marketplace Fairness Act, which would close a loophole that allows online retailers to avoid collecting sales tax. Several senators, among them Senator Lamar Alexander (R-TN), said that they were particularly concerned about states’ rights. Under the current system, states cannot enforce their own sales tax laws; the bill would allow states to decide if they want to require online retailers to collect sales tax from state residents. Others cited concerns about simple fairness: Local small businesses—particularly those that sell high-end goods such as cameras, jewelry, and electronics—often serve as showrooms for customers who then buy online to avoid paying sales tax. The inequity is hurting local small businesses across the country. Opponents of the bill were primarily concerned with the costs and complexity of collection, saying that it would be too difficult and expensive for small online retailers. Several supporters responded that if the bill is passed, more sales tax management services will be created and the market will act to bring down costs. 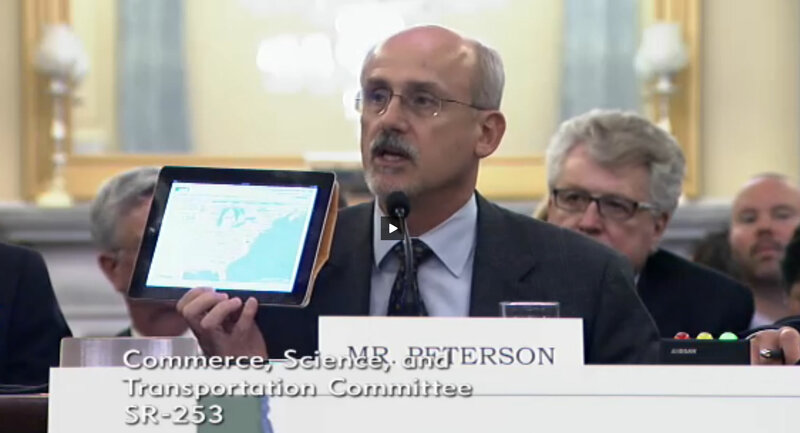 Scott Peterson, Executive Director of the Streamlined Sales Tax Governing Board, testifies before the Senate Commerce Committee, and even shows off to the members of the committee how easy and accessible sales tax has become – that you can even do it on a common device, like this iPad (and yes, that’s TaxCloud). Which brings us to what wasn’t said: The market has already acted. A completely free sales tax management service is available right now. TaxCloud calculates the sales tax due for any region of the county, collects and remits sales tax, files sales tax returns, creates detailed records of sales tax transactions for shop owners, and even provides indemnification and audit relief—in short, it resolves every concern raised by Senator Kelly Ayotte (R-NH). It does all this at absolutely no cost to the business. It’s too bad that this wasn’t mentioned by any of the bill’s supporters, because it directly counters opponents’ primary objection to the bill. We don’t have to wait for the market to act to bring down the costs of collecting sales tax. That cost can range from zero to as much as a business wants to pay, depending on the service a business chooses—there are multiple options already on the market today, including Accurate Tax, ADP TaxWare, Avalara, CCH SpeedTax, Exactor, and TaxCloud. Importantly, a no-cost option is already available. Overall, the hearing showed a great display of support from many senators—and, we were pleased to note, except for only a few instances (which we will resist detailing here), an atmosphere of professionalism, courtesy, and collegiality reigned, even among those who disagreed on the issues. You can view a video of the hearing on the Senate Commerce Committee website. Senate Commerce Committee hearing on Marketplace Fairness Act today! Today at 2:30 pm EDT, the Senate Commerce Committee will hold a hearing on the Marketplace Fairness Act. You can watch the hearing live on the Senate Commerce Committee website. Just refresh the homepage 10 minutes before the scheduled start time to begin automatically streaming the webcast of the hearing. Our hearts are racing (for internet sales tax collection)! Meanwhile, the Senate bill on the same issue, the Marketplace Fairness Act (S.1832), will be the subject of a hearing before the Senate Committee on Commerce, Science, and Transportation next week on August 1. Also, New Jersey Governor Chris Christie has joined the list of Republican lawmakers who support federal online sales tax legislation. He also made a deal with Amazon for the company to begin collecting sales tax on purchases made by New Jersey residents in July 2013, in exchange for which the company will build two new distribution centers in the state. Since Christie is one of the leaders of the Republican party—he is frequently mentioned as a potential vice-presidential candidate—we hope this will put an end to the divisive rhetoric that only Democrats support online sales tax collection. Our opinion: If the bipartisan momentum and support for online sales tax collection continues at the current pace, this issue could provoke a seemingly extraordinary achievement: that Congress can get something done, even in an election year! This legislation is good for consumers, state and local governments, and businesses. Opponents (primarily eBay) claim the legislation will hurt businesses, but their argument ignores the actual substance of the proposed legislation. The Marketplace Fairness Act S.1832 (and the Marketplace Equity Act H.R.3179) require that states simplify and standardize their sales tax systems and they must provide the software (or services) for retailers to easily comply. We strongly support action by Congress on this issue. Today the discussion about state sovereignty over matters of taxation continues unabated. State revenue directors have seen firsthand how the actions of the federal government have affected state and local revenues. Members of Congress are increasingly bombarded by requests for action because state laws are restrictive to business or seen as unfair. There are any numbers of examples where congressional action has been beneficial or harmful to states. The MFA also corrects a growing imbalance between groups of retailers. Under the current court ruling, tax is collected on some sales and not on other sales of the exact same items. Why should tax be collected on a book or camera purchased from a local business and not on an identical item purchased from a mail order or internet business? Remote sales are growing at double digit rates. [v] However, states’ inability to collect sales tax on these sales results in the erosion of the states’ tax bases. Certainly this unfairness is not the hallmark of good tax policy! Congress is creating winners and losers among the retail community by its inaction. Opponents cite two specific reasons for allowing this unfair situation to continue: a) that remote collection would be overly burdensome and complex, and b) that any systems necessary for remote collection would be prohibitively costly. This testimony will provide technical information for Congress to consider when evaluating those arguments. Technology has advanced considerably since the 1967 and 1992 Supreme Court rulings that created the current sales tax situation. Even the more recent of these, Quill, occurred before the first graphical browser was invented, before most homes had internet connections, and long before e-commerce forever changed the retail landscape. Today, forty-five years after Bellas Hess and twenty years after Quill, online marketplaces and auction sites easily manage millions of items for sale at any given moment. Today, keeping track of a few thousand local tax rates and filing requirements is not an insurmountable technical, administrative, or financial burden. TaxCloud, the sales tax management system created by FedTax, proves this point by calculating and collecting sales tax on any purchase for any tax jurisdiction in the United States in less than one second. The service is free to all retailers. The technologies necessary to create such a system are not new; they are well-established. In fact, they are currently being used throughout e-commerce. They are Application Programming Interfaces and Web Services. An Application Programming Interface (API) allows dissimilar and unrelated systems to communicate with each other using pre-established syntax and structure. Web Services allow APIs to be used for machine-to-machine interactions over the internet. Both are now commonly used in e-commerce—for example, in real-time-shipping, which allows a retailer to provide its customers with accurate, real-time quotes for shipping costs based on at least five variables, including weight, size, delivery speed, origin, and destination. Often customers can even compare shipping costs among multiple shippers. With APIs, Web Services, and other technological advances of the past twenty years, it is now possible for remote retailers to easily keep track of every state’s tax laws. Ironically, those who argue most strenuously that remote collection would be too complex are a few large online businesses that already rely on these same technologies every day, in every transaction. The plain fact is that online retailers operate the largest marketplaces in the world by relying on technology to simplify and automate a host of historically burdensome chores, including payment automation, location-specific marketing, personalized recommendations, and even Duties and Value Added Tax management for foreign governments. Opponents also argue that even if technology can solve the technical burden of keeping track of rates, jurisdictions, and filing complexities, such software would be prohibitively costly, particularly for small businesses. TaxCloud is provided to retailers at no cost—so the argument that such software would be prohibitively costly should be flatly disregarded. However, the costs-of-compliance argument also maintains that even if the software is free, businesses will still be burdened with the cost of integrating such software into their existing systems. This line of argument ignores the reality that all but the very largest retailers rely upon pre-written software and/or online hosted platforms for e-commerce and order management. Retailers rely upon these systems to avoid the costs of developing, managing, and maintaining such systems on their own, costs that are magnified by the changing nature of e-commerce. It is no secret that e-commerce is constantly changing to respond to evolving cyber-crime threats, payments and security industry best-practices, and, yes, legislative requirements. When their retailer clients need to collect sales tax, platform vendors will provide ways for them to do so, embedded within the platforms that retailers already use. E-commerce platform vendors are intensely competitive and focused; they take pride in not only complying with evolving requirements but often surpassing them, occasionally with stunning results. For example, much of the cloud computing infrastructure now transforming every corner of the technology sector can be traced to several of the largest e-commerce companies adapting to comply with the Sarbanes Oxley Act of 2002. Most platforms already provide basic sales tax management features for their clients. Upon enactment of MFA, these existing systems will quickly be adapted to ensure compliance. To conclude, modern technology has made it easy for retailers to collect sales tax for any state in the U.S. TaxCloud enables retailers of any size to easily collect sales tax and comply with the provisions of The Marketplace Fairness Act—for free. More information is available at TaxCloud.net. And in addition to TaxCloud, five other companies are certified by the Streamlined Sales Tax Governing Board and ready to assist when Congress authorizes collection—and no doubt hundreds more will emerge soon after legislation is passed, because the free-market system will provide the incentive for entrepreneurs and innovators to develop these products. Please don’t wait to enact the Marketplace Fairness Act until all the parts of tax reform are in place. Passing this one bill can be the foundation for future reform as well as provide great benefit to both state and local governments. It also benefits brick and mortar retailers. Creating the same tax collection system for retailers whether they sell online or in a store is only fair. [i] David Campbell, Chief Executive Officer of The Federal Tax Authority (FedTax), founded the company in 2008. FedTax is a Washington State Limited Liability Company with operations in Washington, Connecticut, and Kansas. Its management team includes highly experienced professionals who have been directly involved in building some of the most recognizable brands in e-commerce, including MasterCard, Google, WebMD, Microsoft, Expedia, and American Express. [ii] Joan Wagnon served as Secretary of Revenue in Kansas from 2003 to 2011. She also chaired the Streamlined Sales Tax Governing Board in 2008-9 and the Multistate Tax Commission from 2006 to 2008. She served on the Board of Directors of the Federation of Tax Administrators for 8 years before joining FedTax to work toward the passage of federal legislation granting states’ collection authority over remote sales. [iii] The notion that out-of-state retailers would find it overly burdensome to keep track of every state’s sales tax rules can be traced directly to the 1967 Supreme Court ruling in National Bellas Hess v. Illinois Department of Revenue. In its majority opinion, the court ruled that “the many variations in rates of tax, in allowable exemptions, and in administrative and record-keeping requirements could entangle National’s interstate business in a virtual welter of complicated obligations to local jurisdictions” (emphasis added). FedTax frequently cites the earlier Bellas Hess quote because it summarizes the ruling’s basis in complexity and burden, which has rippled forward to the present day and created a tidal wave of unintended consequences. This ruling has shielded all out-of-state retailers from the obligation to collect sales tax, based purely on the notion that it would place too much of a burden on businesses. Perhaps it would have, in 1967. That was the year the floppy disk was invented at IBM. [iv] States typically depend on voluntary means of collecting from individuals, such as a voluntary line on the income tax form. Audit procedures, which are used for businesses, are ineffective for consumers. [v] On Cyber Monday (the first Monday after Thanksgiving) in 2011, over $1.2 billion in sales were transacted online. On that day alone, approximately $58 million in sales tax went uncollected. [vi] FedTax has been designated a Certified Service Provider (CSP) by the Streamlined Sales Tax Governing Board specifically for its TaxCloud service. There are six CSPs and 24 member and associate member states. [vii] Although “software and services” is not defined in the Marketplace Fairness Act, likely it will include Application Programming Interfaces (APIs), Web Services, rates and boundaries databases, and a process for certifying service providers to process returns accurately under state laws.